These billet, dome-style horn buttons fit Billet Specialties Billet Steering Wheels, as well as other aftermarket steering wheels with the 9-hole mounting pattern. Standard size buttons do show the mounting bolts. Pro-Style Horn Buttons: 3D CNC machined, polished or black anodized, smooth or riveted (polished and black rivets are both included on the riveted models), the combinations are many the styling is endless! The Pro-Style series of billet horn buttons has taken something as simple as a horn button and turned it into another piece of automotive art. Precision machining paths, billet aluminum construction and the utmost attention to detail combine to form a horn button that is not only functional but will shine in your ride like a piece of automotive jewelery. 32320 is rated 4.0 out of 5 by 1. Rated 4 out of 5 by Vicp110 from Bow tie horn button Looks cool and fixed my horn issue with the supplied ground wire. Fit perfect no issues. Will these horn buttons fit other manufacturer steering wheels? 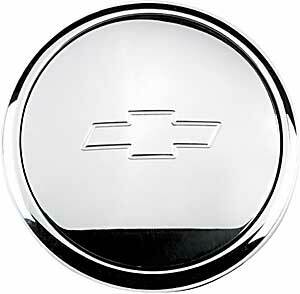 No, the horn buttons are made to fit the Billet Specialties steering wheels.